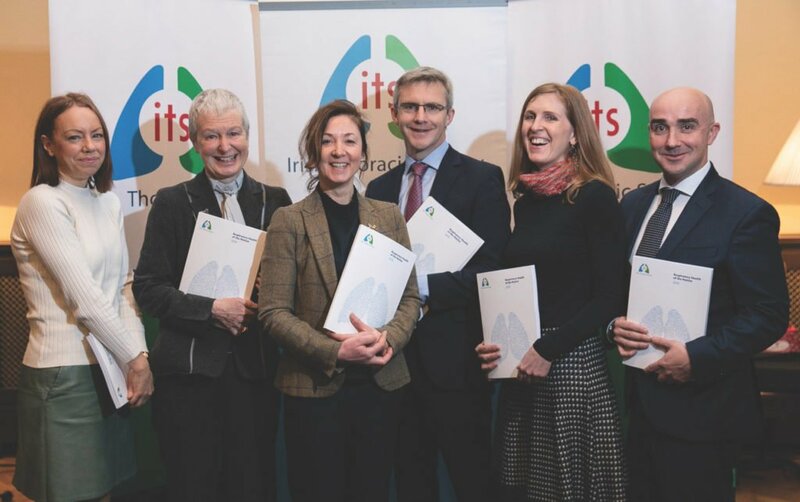 The Irish Thoracic Society recently called for the establishment of a national respiratory taskforce to address the rising tide of respiratory disease in Ireland. The call came at the launch of the Society’s major new report on the burden of respiratory disease on Ireland’s population, Respiratory Health of the Nation 2018, showing it to be one of our most critical health challenges, reflected in the almost 15 per cent increase in respiratory deaths between 2007 and 2016. As well as providing an overview of the impact of respiratory disease in the country, the report details clinical data from a number of sources on 11 common respiratory conditions and their impact on two key population groups — children and older people. Hospitalisation: Respiratory disease now accounts for more hospitalisations than for cardiovascular and non-lung cancer cases combined. One-in-seven of all inpatient hospitalisations were for respiratory disease and the vast majority of respiratory hospitalisations (85 per cent) were for emergency, unscheduled care in 2016. Emergencies: Respiratory diseases accounted for almost 20 per cent of emergency inpatient hospitalisations in 2016. For cardiovascular disease, the figure was 11 per cent and for non-respiratory cancers, it was 3 per cent. Disease types: The big three respiratory conditions causing disability and death are lung cancer, chronic obstructive pulmonary disease (COPD) and pneumonia. Deaths: Respiratory diseases cause almost one-in-five deaths in Ireland (18.8 per cent). In the period between 2007 and 2016 covered by the report, the number of deaths from respiratory disease increased by 14.6 per cent, with 5,720 deaths in 2016. This compares with a 7.5 per cent drop in cardiovascular deaths during the same period. European Union: Ireland’s death rate from respiratory diseases is 38.2 per cent higher than the EU-28 average. He also welcomed recent appointments of Advanced Nurse Practitioners who have the potential to augment services, improve lengths of stay and reduce pressure on emergency departments. However, there remains significant challenges, including a dearth of respiratory specialists, he said: “What is clear from this report is the increasing strain of lung disease on our health services due to our growing and ageing population. “There are too few respiratory specialists, in particular consultants, the numbers of which lag well behind other EU countries, but also nurses, physiotherapists, physiologists and other allied healthcare professionals. In addition, access to elements of good-quality care such as pulmonary rehabilitation is severely limited. We also need to meet the challenge of providing integrated care for conditions such as COPD with a properly-resourced primary care community. “Together with improved focus on prevention, awareness and earlier detection of these conditions, our patients need better access to adequately-resourced, co-ordinated and specialist services based on best evidence-based practice. That’s why the Irish Thoracic Society believes a national taskforce is needed to put respiratory disease on an equal footing with heart disease and cancer where, thanks to dedicated strategies in recent years, patients have experienced improved outcomes. In addition, Prof Morgan said while the Society “welcomes the over-arching vision for the provision of healthcare to our citizens contained in the Sláintecare strategy, this must incorporate a responsive approach to the specific challenge of respiratory disease in order to impact the significant burden on our population and health services highlighted in this report”. Dr Máire O’Connor, report co-author and Specialist in Public Health Medicine, HSE East, highlighted the need for a cross-sectoral approach in addressing environmental and other threats to respiratory health. “Respiratory diseases make up three of the top-six causes of death in Ireland, with the big three being lung cancer, COPD and pneumonia. Death is only the tip of the iceberg of the burden of disease on individuals, families and the health services. While smoking is a key risk factor for many respiratory diseases, we are also seeing the influence of other social and environmental factors on respiratory health. Lung cancer — this causes the greatest number of cancer deaths in Ireland: It accounted for 20.6 per cent of total cancer deaths in 2016. With 1,864 deaths in 2016, it was second only to ischaemic heart disease as a cause of death. There was an increase of 11.8 per cent in the number of lung cancers between 2007 and 2016. However, in the same period, the age standardised mortality rate per 100,000 population reduced from 63.2 in 2007, to 56.2 in 2016. Over a quarter of lung cancer patients (26 per cent) presented initially as emergencies. COPD — Ireland has the highest hospitalisation rate for COPD among selected OECD countries. Over 87 per cent of COPD hospitalisations are classified as emergencies. It is the second-most common cause of death from respiratory disease, and is responsible for more deaths than any non-respiratory cancer in Ireland. In 2016, among those with GMS eligibility, medications costs for COPD were €67.6 million. Pneumonia — this is Ireland’s third-most common cause of death from respiratory disease, and the fifth-most common cause of death overall. In 2016, it caused over 1,000 deaths, compared to 1,125 in 2007. Although people with pneumonia and acute lower respiratory infections (unspecified) are largely treated in the community setting, in 2016, they accounted for 31.7 per cent (29,293) of respiratory inpatient hospitalisations and 40.3 per cent (231,819) of respiratory inpatient bed days — 58.4 per cent of these hospitalisations were among those aged 65 years and over. Asthma — Ireland has one of the highest rates of asthma in the world. Current estimates suggest that the prevalence of doctor-diagnosed asthma in children is 21.5 per cent and 7-to-9.4 per cent in adults. The number of day case hospitalisations for asthma increased from 1,336 in 2009, to 2889 in 2016. In terms of inpatient hospitalisation, the age-standardised rate in 2016 was 46 per 100,000 population. Almost all, 97 per cent, hospitalisations were emergencies. Cystic fibrosis — Ireland has one of the highest global incidences of cystic fibrosis. There has been little change in the number of inpatient hospitalisations over recent years. In 2016, there were 1,110, of which 72 per cent were classified as emergencies. The majority of hospitalisations were in the age group 16-to-64 years. Tuberculosis — While the number of cases of tuberculosis has fallen over the last decade, this decline has levelled-off in the past two years. In 2016, 318 cases were notified and 20 people died from TB. In 2016, the highest age-specific incidence rate was in those aged 25-to-34 years, with 42.6 per cent (136) of cases notified as living in HSE East. The areas with the highest crude incidence were Dublin North West and Dublin North Central, which are both areas of higher social deprivation. Interstitial lung disease and sarcoidosis — Sarcoidosis and idiopathic pulmonary fibrosis are among the more common of the 300-plus interstitial lung diseases. There are approximately 350 deaths each year from these conditions in Ireland. Each year, there are approximately 900 day cases and almost as many inpatient hospitalisations with these diagnoses. Obstructive sleep apnoea (OSAS) — OSAS is increasingly recognised as a public health problem internationally. There is no data available nationally on its prevalence in Ireland. However, given its link with obesity, and Ireland’s obesity epidemic, it can be assumed to be a potentially sizable problem in Ireland. As a reflection of this, the number of hospitalisations almost doubled between 2007 and 2016 (1,203 to 2,241), sleep studies were among the top 20 principal procedures reported by acute hospitals in 2016, they were among the top five procedures for elective hospitalisations, and sleep disorders were the fourth-most common principal diagnoses among elective inpatient hospitalisations in 2016. Young people: Respiratory disease accounted for over a quarter (26.7 per cent) of hospital admissions in those aged 0-to-15 years. A quarter (25 per cent) of children’s consultations with GPs are for respiratory problems. Older people: In 2016, more than two-in-five (43 per cent) of those hospitalised for respiratory problems were aged 65 years and over. and over, compared with 16 per cent for cardiovascular disease, and 7 per cent for non-respiratory cancers. See full report at www.irishthoracicsociety.com.